​ Due to experience of the past, maintaining cordial relationships is a prime concern of this organization. Deviations from accord will be reviewed by a Council of three with the facts presented to the general membership for a vote. We prefer to avoid problems by emphasizing the primary goal as getting along with one another. As we have few members at this time, all members need to sponsor a prospective member if there is one in their area of the country. An application with letter of introduction should be sent to one of the 3 Council Women. The letter of introduction should include why the person would like to join the Women of the Morning Star. There will be interim Council Women until an election can be held hopefully at the 2017 AMM rendezvous. In the old times, if a woman died without passing on the knowledge she acquired, that knowledge passed to the Morning Star. In modern times, women are encouraged to acknowledge the Morning Star, and the women of the past who inspire us, to retrieve the lost ways. We dedicate ourselves to this learning, and passing on the knowledge to future generations. Part of the overall requirement is to keep a journal of each requirement completed with documentation of who witnessed the requirement being performed, specific details of how it was accomplished, and any difficulties encountered. The journal should be fabricated or purchased and be of period correct materials. This journal will need to be submitted for review so should not contain entries of a confidential or private nature. The first 6 requirements are compulsory and need to be part of the first 10 requirements. These 6 are all needed for moving from the probationary period to sister level. 1) Social Skills: In the tradition of generosity that is very highly regarded by Native American tribes, gift two items of own making to any person other than a relative or a spouse. It is encouraged to continue this tradition by gifting an item every year. 2) Dress, tools and accessories: It is required to make a complete set of hand cut and hand sewn clothing and handmade accoutrements. These must be researched for authenticity of the 1800-1840 period and be of the type worn by Native American women. Accessories that would normally have required the work of a specialized craftsperson such as pots, blankets, canteens, need not be handmade, but must be as authentic as can be purchased today. Non-horse women are not required to have horse gear. All items of dress must be worn to attend encampments. Bark-tan used only where applicable. Items used by prospective member must be researched for correct materials and design also they need to be gender use correct. 3) Fire Making: must be able to start a fire in wet as well as dry weather, using flint and steel or fire drill, additionally using tinder and wood found under natural conditions, and be able to demonstrate this skill at any time to council. 4) Seasonal Camps: Prospective members need to have spent two days and one night in a primitive camp during each season of the year, total of 4 camps during the 2 year probationary time. Drive up type camps do not count towards this requirement. 5) Primitive Cooking: Must be able to cook a meal of meat using only the meat, fire, a knife, and materials found in nature. 6) Hide Tanning: need to be able to brain-tan a hide, and make something out of part or all of the hide. 7) Container Making: It is important to make an item of parfleche, which are rawhide containers, using earth pigments, hide glue, and finished with a natural sealant. Parfleche should be used whenever possible. All members should be prepared to prepare, and make belts that the Women of the Morning Star present to members as level advancement. 8) Demonstrate and Teach: Must be able to demonstrate the skills needed for primitive survival in her area, and must be willing to teach those skills to other members, such as cooking, fire starting, collecting wood, sewing, etc. Demonstrations requiring preparation will be requested ahead of time. 9) Camp Construction: Must be able to set up a tipi alone or construct a permanent debris shelter. There can be help with the tripod and with the canvas. No other help is permitted. The shelter must be able to handle weather, and be of a documented North American tribe. The type of materials should be the kind used for that type of shelter. 10) Decorative: Make one item decorated with quillwork, and one decorated with beading. Beads need to be Bodmer blue, Pony Trader blue, white, and small amounts of black, red White Hearts, greasy yellow, less of pumpkin orange. Thread should be linen, cotton, silk or sinew of the techniques used during the pre-1840 time period. The amount of quillwork depends on the applique style used. One quillwork technique is required. Jean Heinbuch’s book A Quillwork Companion will be used as a guide. All members should prepare to quill neck bags presented to new sisters. 11) Group Social Skills: Help prepare a feast for a large group of people using traditional foods that are off the land or period correct, such as those acquired from a rendezvous. The foods and cooking methods must be period correct. This activity may be done by a group of sisters. 12) Trade and Barter: Obtain and braintan a hide, then trade to a trapper for a trade item, not money. Trapper cannot be a spouse or relative. The hide must be well tanned and soft, showing quality and skill. Must bicker and barter to get the full value for the hide in trade goods. 13) Herbology: Know 10 edible and 10 medicinal plants of your wilderness area, and must have gathered and used these plants as medicine or in a meal. 14) Packing: Must be able to demonstrate the ability to properly use and pack a travois for dog or horse, or pack a horse, canoe, bullboat, toboggan, or a woman for distance travel under possibly adverse conditions. 15) Cumulative Camps: Spend a cumulative time of two or more weeks in the wilderness under primitive conditions in the company of no more than 4 people. Each camp must be at least 3 full days, and 2 full nights. One camp can be a drive and dump camp, all others must be a packed in camp. Animals may be used for packing camps either by travois or panniers. 16) Seven Day Rendezvous: Spend at least seven days in a primitive encampment in the company of other Woman of the Morning Star members at any territorial rendezvous such as AMM, Eastern, Western, Pacific, or any Nationals, for example the Rocky Mountain Rendezvous. All dress and equipment must be of WMS standards. Non-period gear such as inflatable mattresses, coolers, plastic water jugs or plastic of any kind is not allowed in camp. Meat should be in period correct packaging for instance cloth bags, parfleche, bladder, pericardium, or leather. You may not return to the parking lot, or your vehicle, until the seven days are completed. The AMM/WMS national rendezvous is a pack in only camp, drive and dump is not an option. 17) Five Day Travel: Must have spent at least five days traveling on foot, snowshoe, canoe, and/or horseback. One method or a combination may be used. Bullboat may be used in place of a canoe. You are expected to gain as much distance as possible. This trip must be under primitive conditions, taking nothing that would not have been available to a woman during 1800-1840 (other than personal medication and a camera, used discretely.) Weapons are optional. May use a travois and dog or horse for foot travel. 18) Protection and Hunting: Must be able to shoot a muzzleloader, hit a pie plate 3 out of 5 times at 50 yards for the level of sister. For Council Woman level must be able to hit pie plate 3 out of 5 times from 75 yards. Must be able to load and clean your firearm. For those who do not have firearms, archery may be substituted: primitive bow is a stickbow in the style of the Western Indians, with or without sinew backing, and with dogbane, sinew, or linen string. Primitive arrows are whole shoots, feather fletching, may use steel field points for target practice as stone points are brittle. Must be able to shoot 4 arrows out of 6 in an eight inch target at 15-20 yards. This is comparable to what Blackfoot or Yahi children could do at age 8, able to shoot rabbits. 19) Assistive Hunting Skill: Must be able to properly field dress (clean and skin) a game animal under primitive conditions. This could include skinning and hooping a beaver. As a trapper’s woman this would be a common skill. 20) Communication: Must be able to converse using Plains Indian hand talk. Tompkin’s book, Indian Sign Language, will be used as a basis for conversation. To complete this requirement you must demonstrate your ability to read the signs for 60 words, as well as give the signs for 60 words. Must be able to tell a story or hold a conversation using sign language. 21) Make Meat: Must have fished or hunted for and killed at least one game or fur animal with a muzzleloader, primitive bow, primitive fishing gear, snare, trap or deadfall. Must have used as much of the animal as possible so that little is wasted. The hide for clothing or accouterments, the meat for food, bones for their marrow or for tools. The hunt must be made from a strictly primitive camp, the hunt accomplished under primitive conditions and within the limits of local game laws. 22) Living off the Land: Must spend at least three days and two nights living off the land. No food can be brought in with you. All sustenance is to come from what you can find in nature. It is expected that you find food and that you provide your share of food for the group. 23) Research: Make a study of some aspect of the life style of women (pre-1840) and submit a report to this association with the intent that it may be submitted to a journal for publication. The subject of research can be anything social, crafts, skills, etc., anything significant in a woman’s life. 24) Braintan an Elk or Buffalo Hide: Must be a full hide and not a partial cut down from a trophy mount. 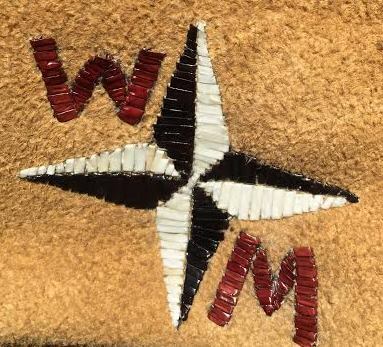 This hide will be donated to the Women of the Morning Star for whatever purpose is suitable at the time. Hide should be unsmoked. 25) Quill Dying: Personally collect from nature one natural mordant and two different natural color dyes. Dye the quills and use the quills in any stitch that requires two or more quills at one time, such as: two quill diamond, four quill diamond, checker weave, etc. The quill work must add up to four square inches. Jean Heinbuch’s book: A Quillworker’s Companion is a good reference source. 26) Basketry or Weaving: Make a container such as a basket, bag, finger woven sash, or bag strap, by weaving using appropriate techniques. Make item from all natural materials such as grasses, bark pine needles, real sinew, natural cordage, Indian hemp (dogbane), rushes and willow branches. For example birch bark baskets, woven willow bark baskets, non-wool/non corn husk sally bags, tule mats, and 100% period color wool sashes (hand spun wool yarn may be purchased). Container must be fist sized, and mats must be six square feet. Sash should be long enough to wrap around waist one time without using tassels. This requirement does not include rawhide containers. We encourage members to do projects that have not been previously mastered. 27) Primitive Pottery: Clay can be purchased or gathered. Container must hold one cup of liquid without leaking. Pottery must be fired naturally by wood burning or clay kiln. Kiln must be of Native North American style. 28) Booshway (bourgeois) a Camp: This requirement is designed to gather members for friendship and ideas. Booshway must send out an open invitation on a set date and have two or more people attend with the booshway. The camp members need not be WMS members but camps and gear must uphold WMS standards. You are setting an example, therefore drive and dump is not allowed. 29) Extensive Research and Skill Development: Set a personal goal for yourself. Must be within the pre-1840 Native American or Fur Trade era studies. This should include extensive research and development of an active skill to a high level of expertise. This must be different from the research paper (#23). 30) Construct a Primitive Shelter: Hand stitch a portable primitive shelter of hide, canvas, or oil cloth. Must be adequate shelter for at least one person in any weather condition. Must be portable on your back or on a horse and be pre-1840 period correct. Oil cloth can be purchased or hand made. *Women of the Morning Star are not responsible for any illness or injury that may occur while working on requirements for membership. Each member or potential member must assume all responsibility for their own actions.